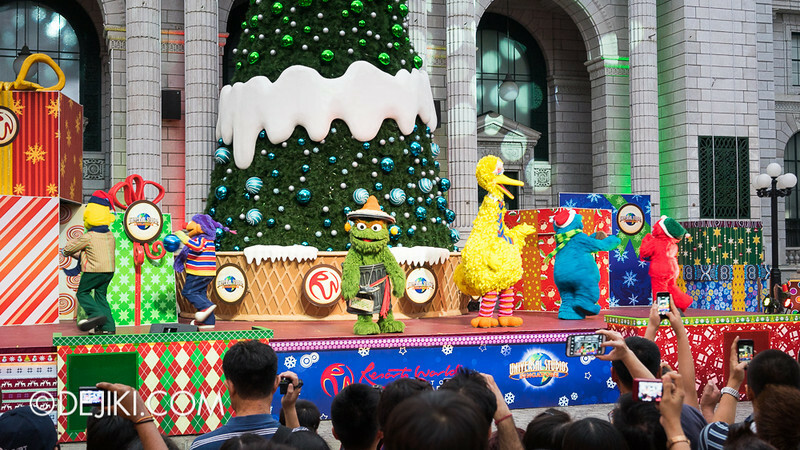 Join in the festivities at Universal Studios Singapore this holiday season! Read all about this year’s Christmas programme and some new additions at the park. 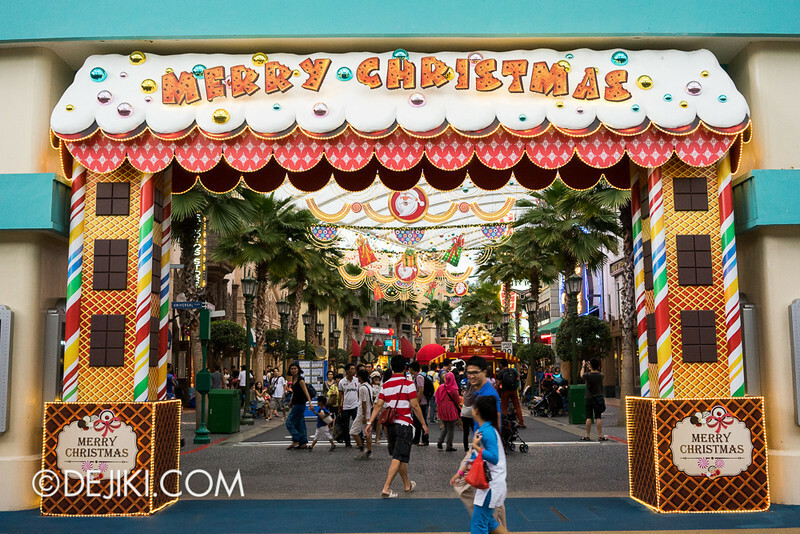 It’s Sugar-rush Christmas at Universal Studios Singapore. 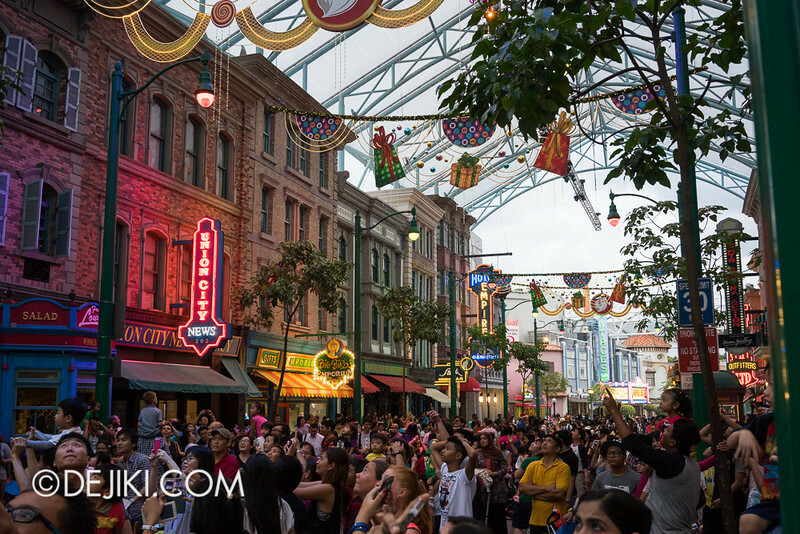 Lots of bright theming resembling candy, chocolate bars and other sweet treats. Some guests waiting with night passes, waiting for admission to start at 6:00PM. These tickets go for $40 each and come with a $5 dining voucher. 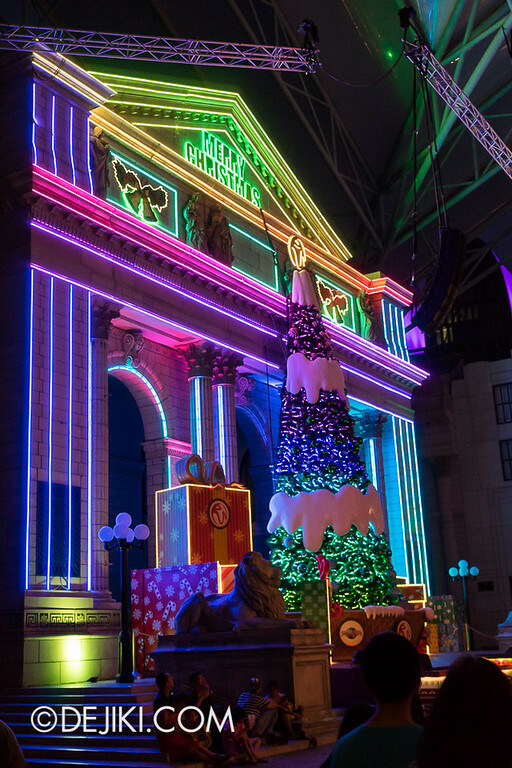 From now till 30 December, the park will be open from 10:00AM till 10:00PM daily. 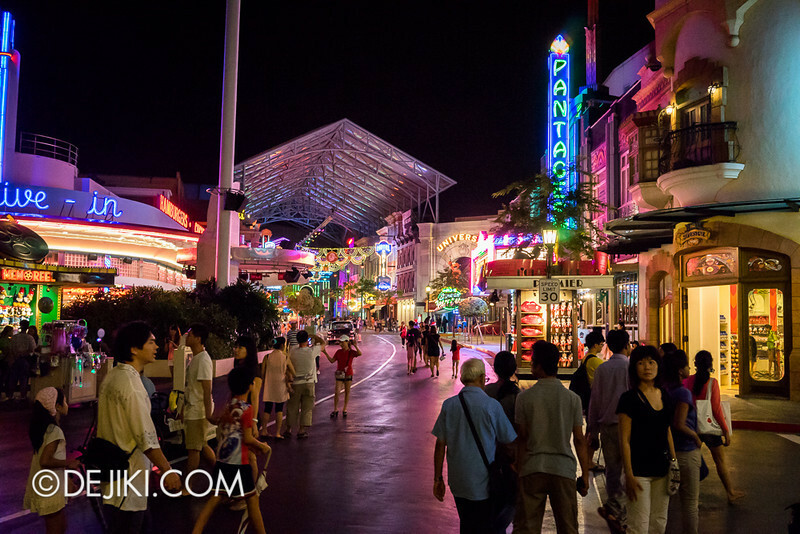 Apart from extended operating hours for theme park rides, additional live performances of Waterworld and Monster Rock have been added so that guests can enjoy them at night. 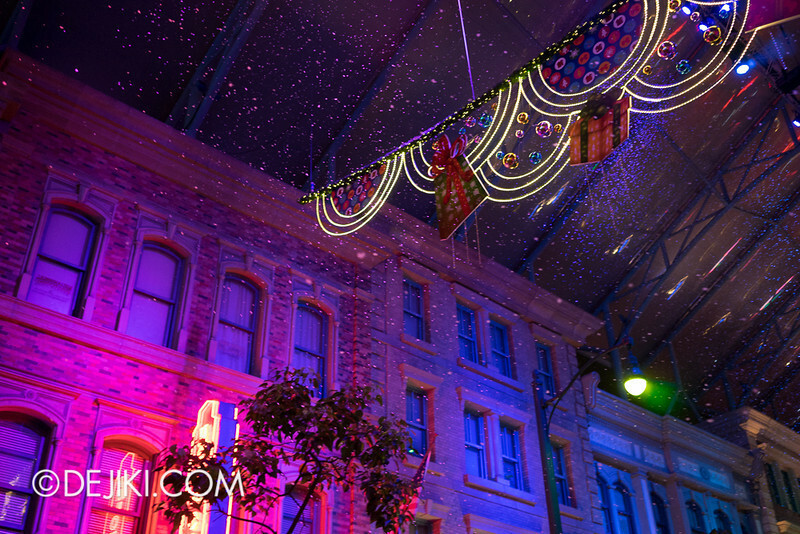 Just like years before, only Hollywood and New York are decked in festive decorations. 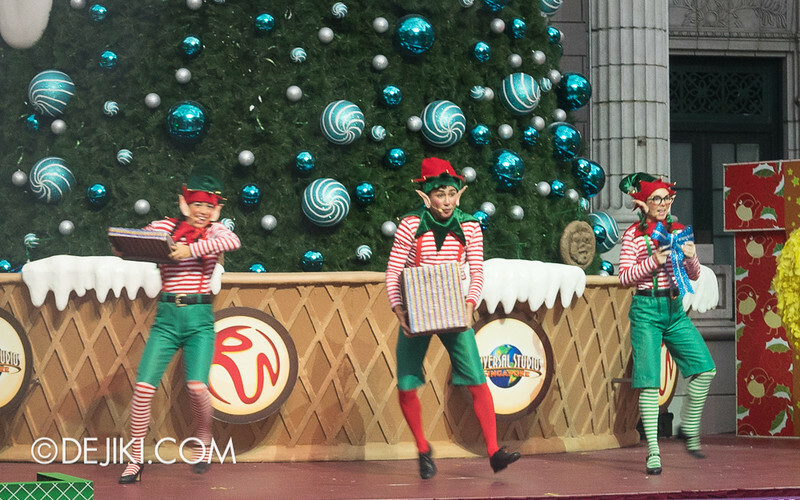 Around the park, crew members are wearing red christmas hats. 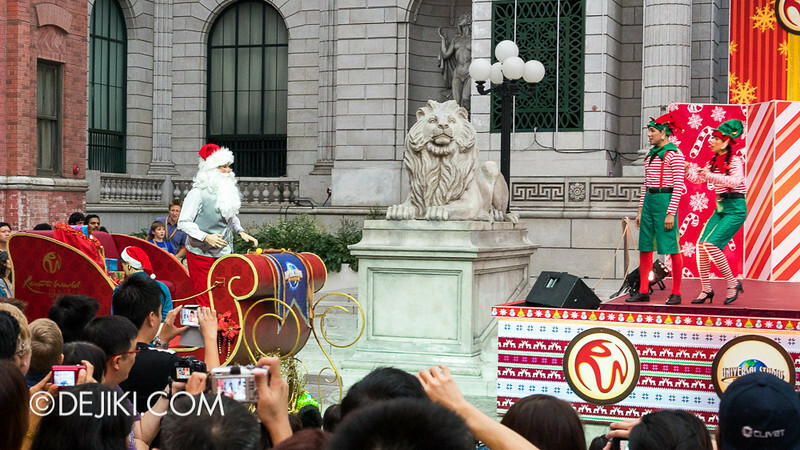 Of course, the New York Library is the heart of christmas celebrations, with two shows and snowfall taking place here several times a night. 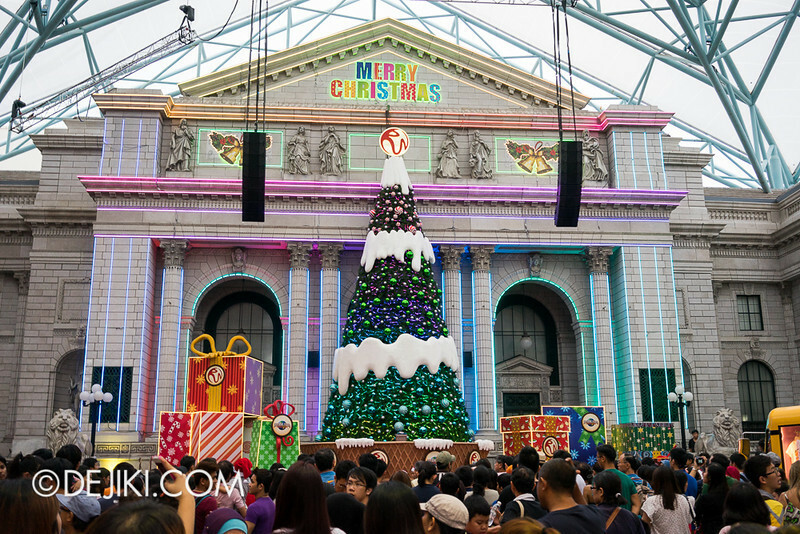 Here are the show timings for 2013 Christmas shows at USS. The shows are performed at the New York Library section of the park. 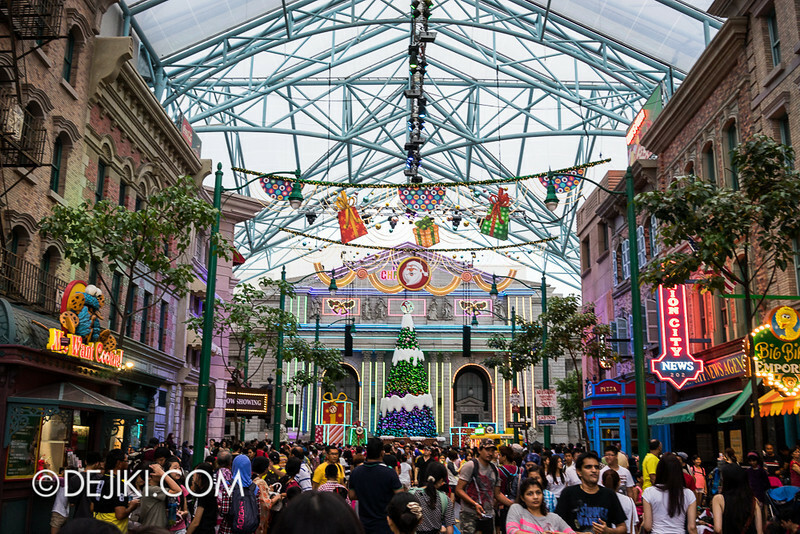 As for the park’s usual performances, there are extra shows scheduled to allow guests to enjoy them later at night. The schedule varies each night so only use this information for rough planning. Please check the Times Guide at the park on day of visit for correct schedule. I would suggest watching Waterworld at night if you haven’t. It’s a slightly different experience because the explosions feel more impactful against the night sky. 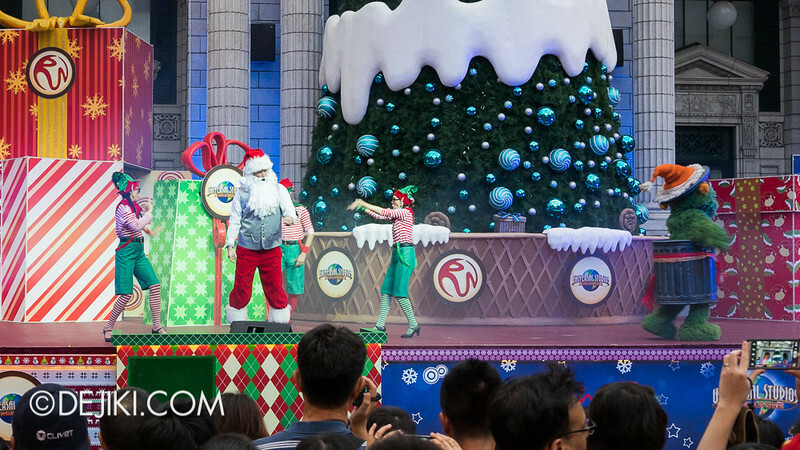 This all-new show, which is about 16 minutes long and performed three times each night, is a story about the Sesame Street characters meeting Santa Claus and the elves. 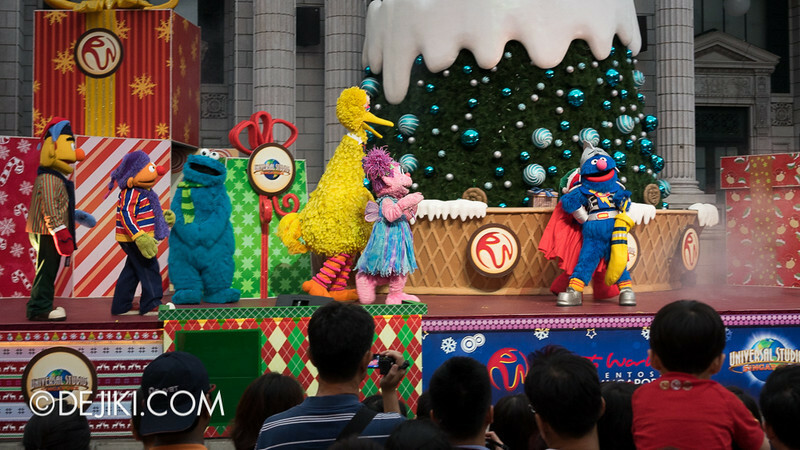 All of the park’s Sesame Street characters are involved, such as: Cookie Monster, Oscar, Big Bird, Bert, Ernie, Super Grover, Elmo and Abby Cadabby. 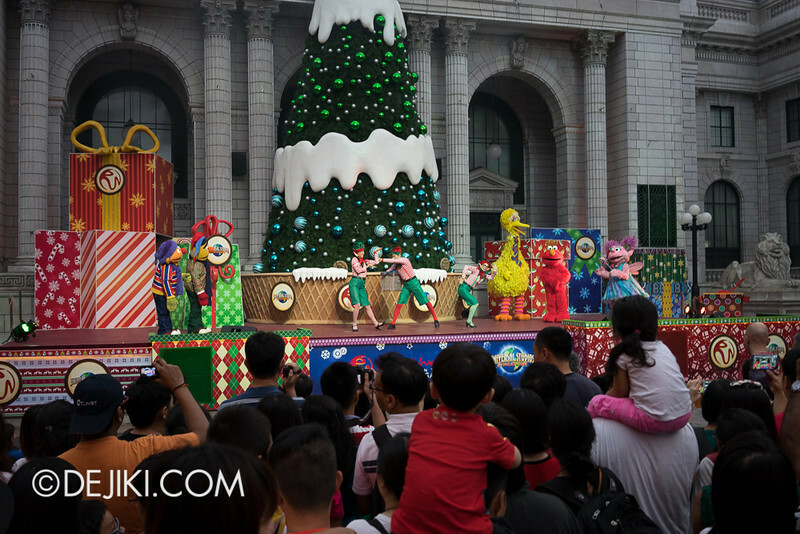 This show is a lot more popular than the Christmas shows in past years, so do arrive 15-20 minutes early for a good viewing spot. 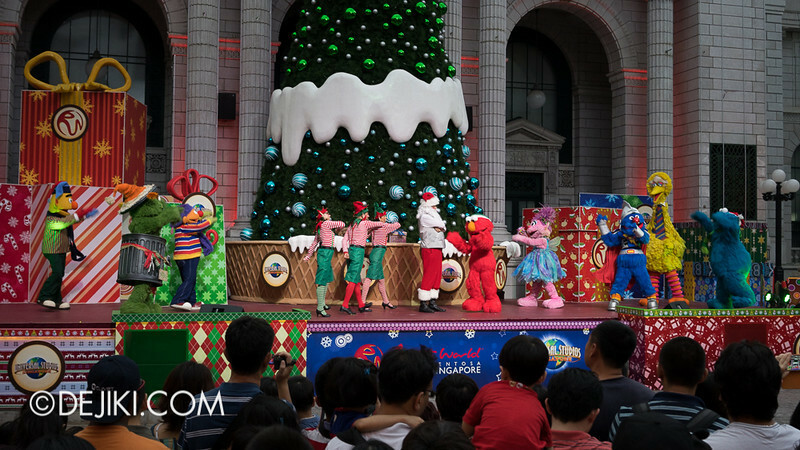 When Santa decides to cancel Christmas, the Sesame Street friends decide to save the holiday in their typical silly fashion. The team transforms Super Grover into the new Rudolph, giving him a sparkling red nose. In the end, Santa announces that Christmas is back on! Snow starts to fall, and Santa goes up to his sleigh (for a mini ride to the middle of New York). Of course, Super Grover ends up pulling it. Anyway, towards the end of the show, snow starts to fall at New York. 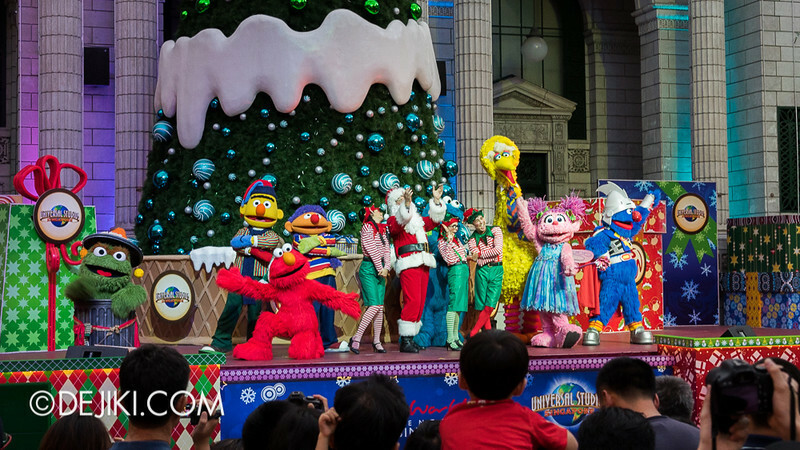 While not exactly showstopping or amazing, I felt that Sesame Street Saves Christmas is one of the better shows the park has staged so far. It’s good to see the park making some effort in producing a new show (the last one, with Daddy-Os and Dinettes, aren’t exactly memorable). Right after the show, snow will fall again at New York. 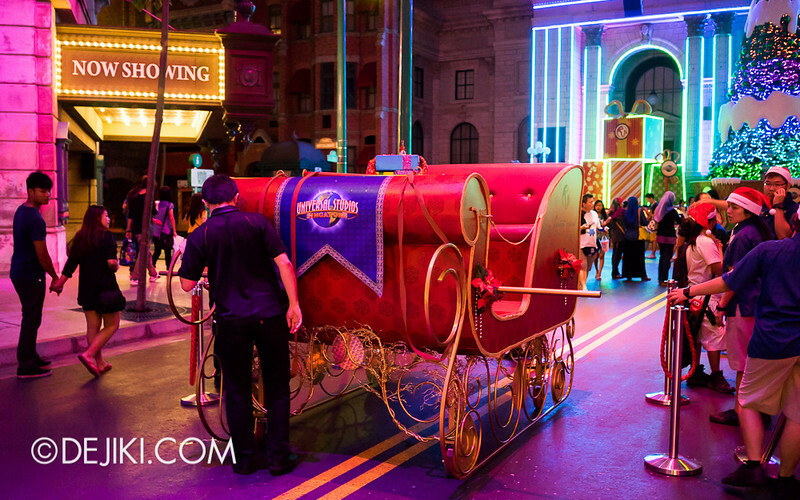 This is the Christmas Sleigh that is used at the end of the Sesame Street Saves Christmas show. It’s parked here until preparations for the next show. 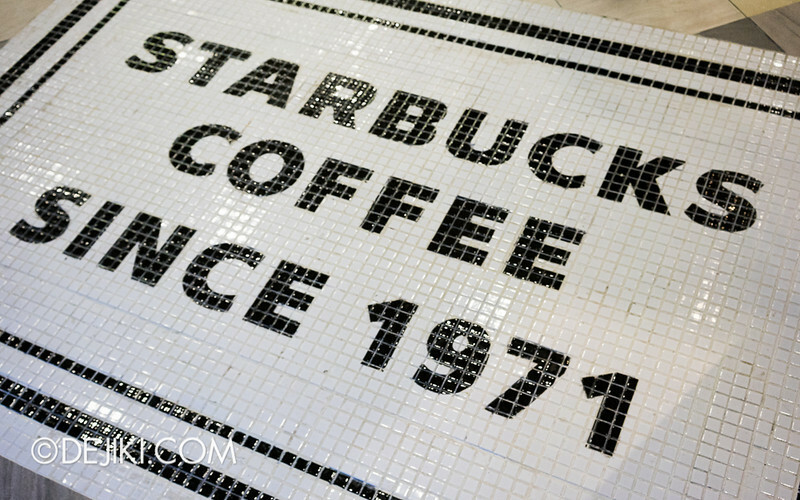 The park’s Starbuck Cafe has opened and well… it feels like any other Starbucks. 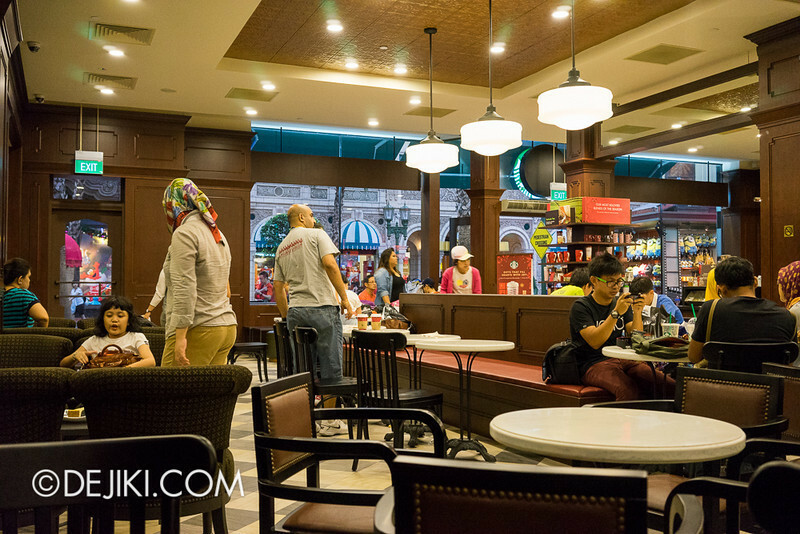 This new cafe has a much larger capacity than the old Celebrity Cafe and Bakery. However, it also lost most of the charm of the original venue. Too many tables (and round tables, all side by side?) 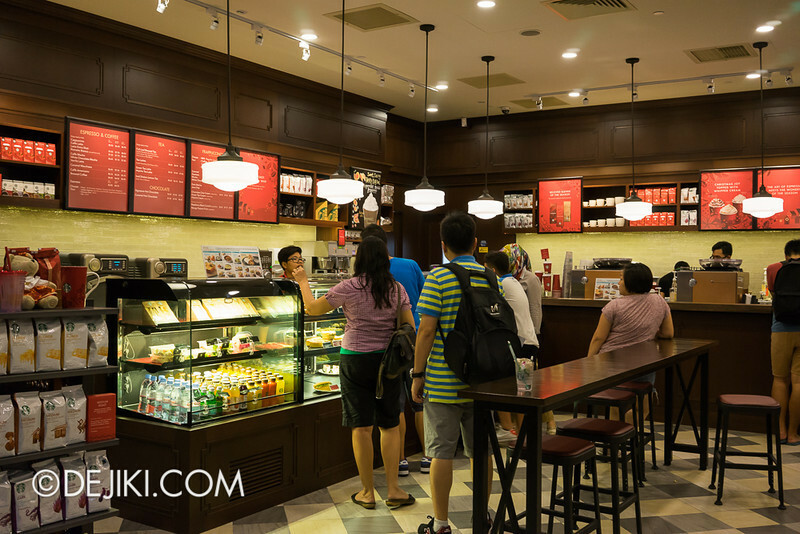 makes some parts of the cafe very cramped and hard to move about. 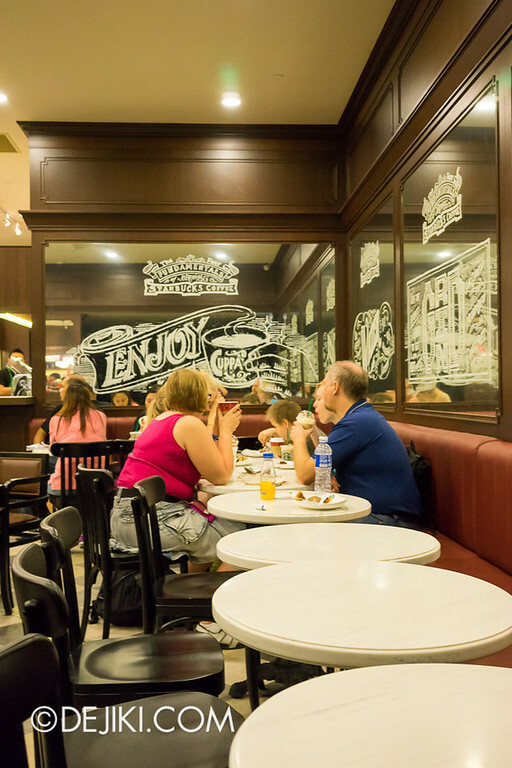 But otherwise, it is a decent place to relax – especially after a long day at the park. I might come here to write blog entries. The next event at the park would be Bubblegum Pop 2014 Countdown. Find out more about it here. 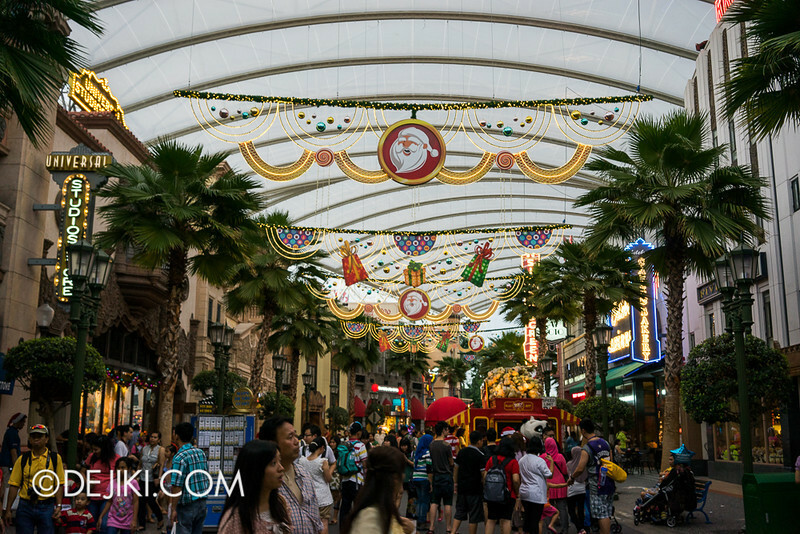 Anyone planning to be at USS for the countdown? Hey DJ, I have finally acquired the Annual Pass on 22Dec. Went to the U on 21Dec and thought I might as well top up to get the AP. Had meals and beers (1-4-1) at KTs and China Bistro. I found the wagyu burger a bit too well done. But the bangers and mash perfect and great big size. China Bistro fried rice was a tad oily and tasteless. 1-4-1 beers was a good deal and will be something to enjoy tonight… Xmas eve. So if you’re going to the U tonight, see you there! I should be going tomorrow afternoon (again) with my mom and nephew. Hope he behaves…. I think I got a crush on one or more of the Mel’s Dinettes. I could just repeat visit just tohear Mel’s Dinettes sing… The same songs, again and again. Their fakes smile, plastered make-up face and bouncy short, revealing retro dresses. So cute and I am adoring them. My current crush. Thank goodness for unlimited entry annual pass! Will characters be available during the new years eve party? Up to now, I’m still thinking about who The Nile Princess is! I think she might be the Scorpion King’s queen from said movie. Hi J, yes, characters will still be available. The Nile Princess’ true identity is up to your own interpretation. According to a performer, it can be either Anck-su-namun or Cassandra. Very interesting! Do you have any idea if Mae West still meets? Also, I randomly looked at the online Audition page 2013 for USS and found a character description for Austin Powers and his female sidekicks. Is he going to debut soon? 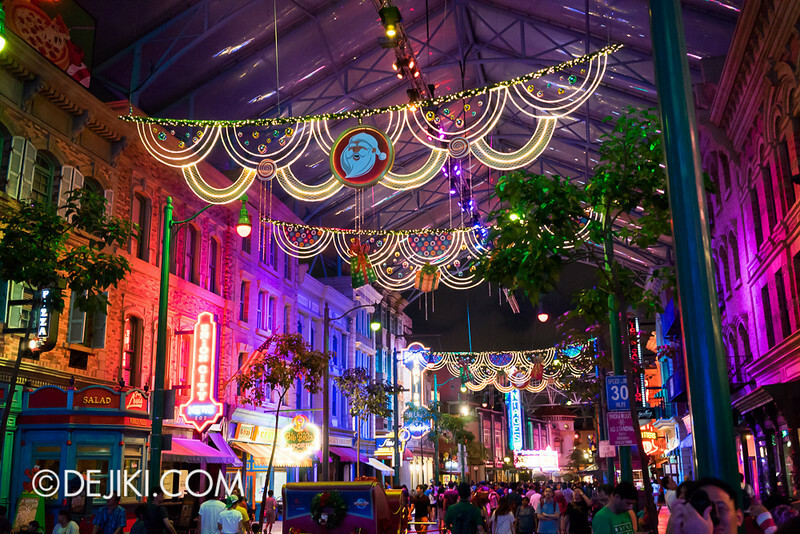 NYE’s coming and I hope to countdown at USS. Why not, with free entry with my newly obtained Annual Pass. However, at this juncture, my concern is with evacuation plans. How difficult will it be to get a taxi from RWS? This is the deciding factor. There may be very little left to do on the island after 1am. Appreciate your kindest advice on NYE’s at USS. Any other tips will be very useful too. I guess I should be expecting crowds. 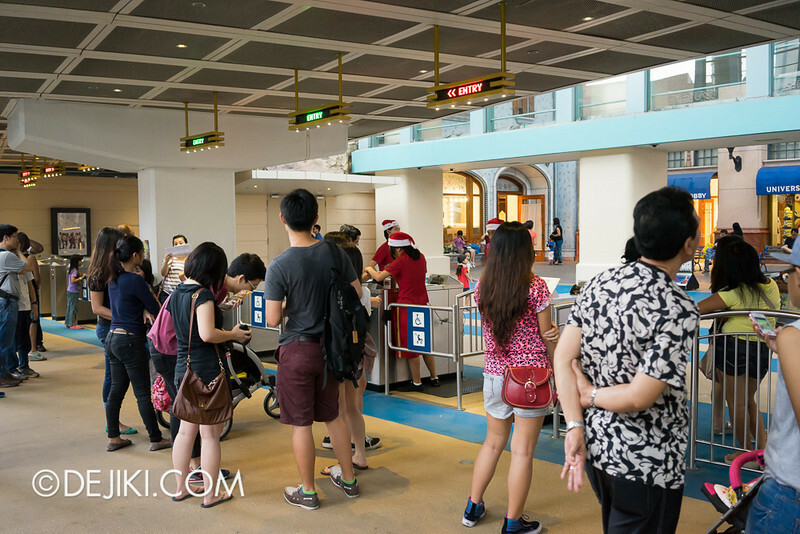 As long as you are willing to wait, taxis will always be available at the taxi stand at RWS Basement Carpark. 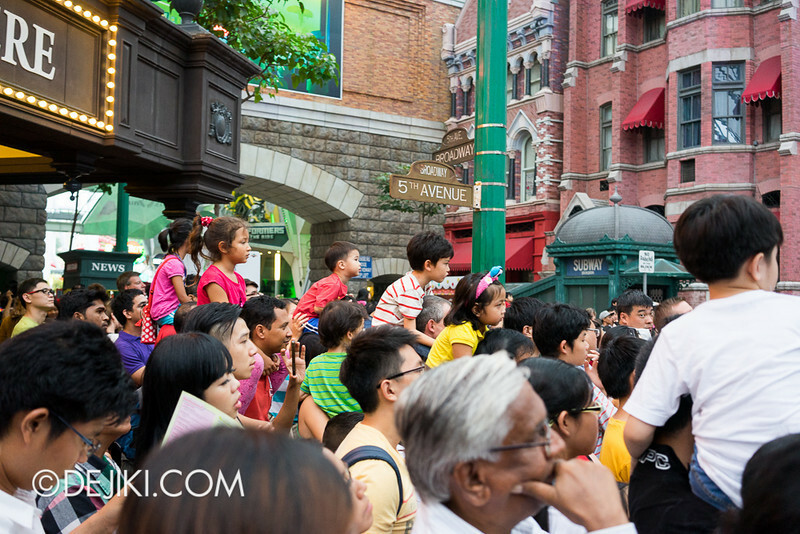 I usually leave the park immediately after the countdown (as the fireworks begin) and usually wait about 2-3 minutes. Lots of people leave the park around that time too, so I try to be ahead of the horde. I’m not sure about what will happen after 1AM, but if Halloween Horror Nights is any indicator, there may be a 20-45 minute wait. Other tips… well, it depends on what you want to do. 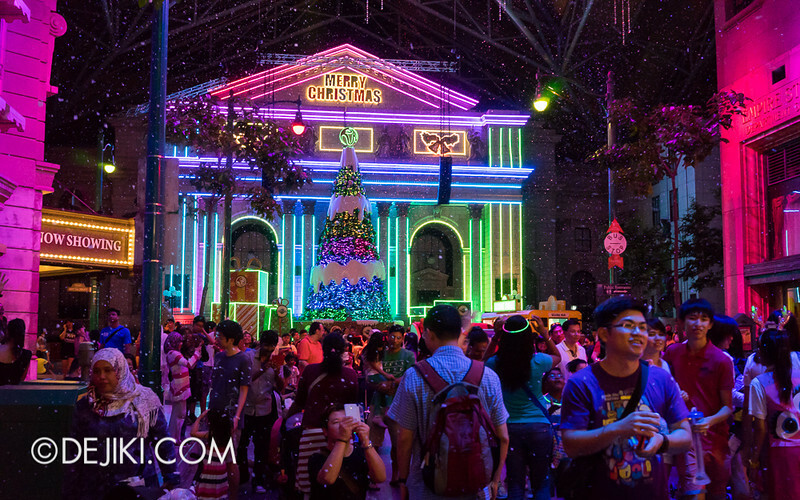 If you’d like a good view of the bustle during Countdown, be at the stage in front of the park’s fountain early to wait. The entire Hollywood zone will be crammed 15-30 minutes before (I think this year might be the worst as Annual/Season Pass prices have hit rock bottom). Essentially, pick a spot to stand for the countdown at around 11:30PM and just stay there until it’s over. Thanks. I am a smoker, so my favourite spot is the Madagascar smoking point. Maybe the NewYork smoking point. Any further in, i reckon will be hard to evacuate. Anyway i finally caught the Monsters rock show rom the front row seats. The cast must be realy tired doing the same show again and again… Maybe there is a rotation. Then again maybe not. Mel’s Dinettes rotate, as far as i guess. Some double-up as a different character for the dreams parade. So far i have clocked 20times on The Mummy ride… And it stil spooks me. Can never remember when the dips happen… Dark and frightening. Transformers is too easy now. But i like the 3d efx. So when can i meet you inside the park? Great to hear that you are enjoying the park and making good use of your Annual Pass! 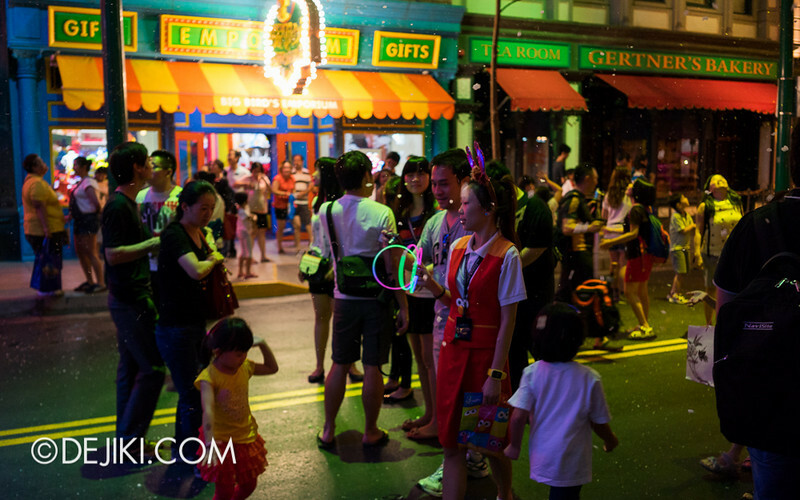 I will be at the park for Bubblepop Countdown 2014.